In my style, I’ve well missed the 2017 Planning Party hosted by Yvonne at Quilting Jetgirl, but I thought I would write a quick post with my 2017 Goals and word for the year, both to share my focus and to hold myself accountable! I’ve been thinking long and hard about what I want to focus on this year, and I’ve decided that I really need to make my mantra: “Finish What You’ve Started”. I have ample projects that were begun with excitement and then quietly forgotten before reaching completion, and I also branched out into a few other big new endeavors in 2016, such as pursuing quilt photography work and designing for Quilt Theory. I’ve been helping Stephanie with the Quilter’s Planner Instagram account, and that has been extremely fun but also takes time. I also have a few potential teaching opportunities that I’m excited about in the coming year. Combined with being a full time mom of three little ones, keeping house, tending chickens, and in the proper season, gardening and adventuring along the coast, my plate is pretty full as it is. So it seems right to set my engine for steady on and just keep plugging away in the direction I’m going. I’ve used the Projects at a Glance page in my Quilter’s Planner to list WIPs from 2016 on the left and new projects in 2017 on the right. The right shows my color palette choice for my 2017 bee and sew alongs–greenery! Which brings me to my “one little word”–the one word to guide my year. 2017 will be my “green” year. There are so many influences to my selection of this word, from my lifelong love of nature, my degree in environmental science, to all that’s been happening in the world around us. Sparked initially by Chawne Kimber’s quilt “The One for Eric G”, the first statement quilt I saw that made me hold my breath as my stomach took a nosedive, and made me realize that this amazing craft can be used to inspire positive change (more than just making the world a more beautiful place one stitch at a time), further melded and inspired by the Make Do Quilt challenge posed by Sherri Lynn Wood last year, and always continuously inspired by Hillary from Entropy Always Wins and her focus on using reclaimed textiles in her creations, I have decided on “green” as my word of the year and “finish what you’ve started” as my guiding mantra. 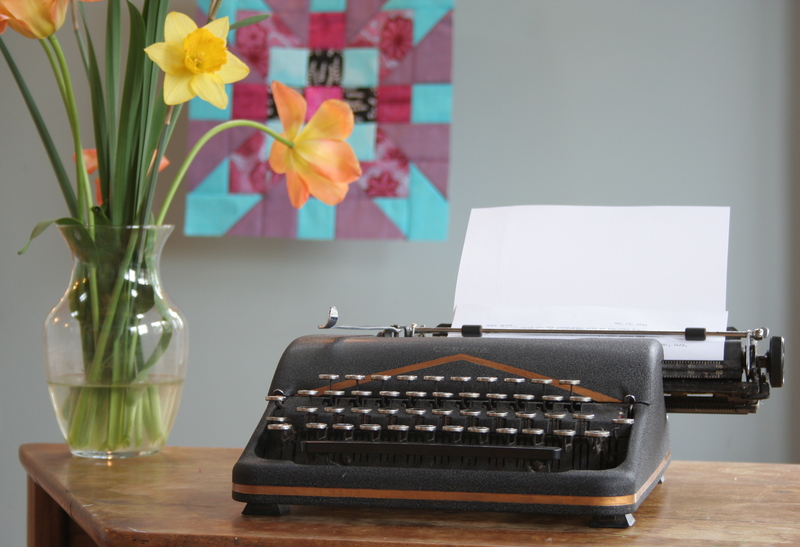 Teach at least three (3) different quilting and quilt photography related classes–spread the love and inspiration for creating beautiful things! Use my Quilter’s Planner to set manageable goals and help myself feel successful and motivated–including building up to exercising 5 times per week! Finish eight to ten (8-10) works in progress from last year!!! Phew, I’d better stop there. I think this is a great start to my goals for the year, and I’m curious to see how successful I am at meeting each of these goals. Note that I have not included pattern design in my specific goals this year. Aside from Quilt Theory patterns, two of which I plan to develop and release this year, I am letting pattern writing be more relaxed this year so that I may focus on my other goals. It doesn’t mean it won’t happen, though! So far I’m off to a decent start and have made good progress on one WIP (Max’s Eye Spy Picnic Plaid), and have finished another, which I’ll share later this week. (Note that I’ve added quite a few old WIPs to this list since this photo was taken). I’ve begun to play with the #beesewcial prompt, and am incorporating repurposed textiles into it! Baby steps! I hope your year is off to a great start! I’ll be linking up with Sew Fresh Quilts’ Let’s Bee Social so that you can all hold me accountable this year! Earlier this week marked two years since I first began writing this blog. That’s right… two years. It feels like such a short time, yet I feel like so much has happened here–sharing stories and inspiration, making friends, keeping on top of project progress (or lack thereof! ), improving techniques together, and so much more. It has been a full two years, and I’m so grateful to you for joining me on my journey. I’ve always been one to set my goals high, which often is a good thing. If there’s a technique or project I want to try, I just go for it. If I want to create my own patterns, I dive in. 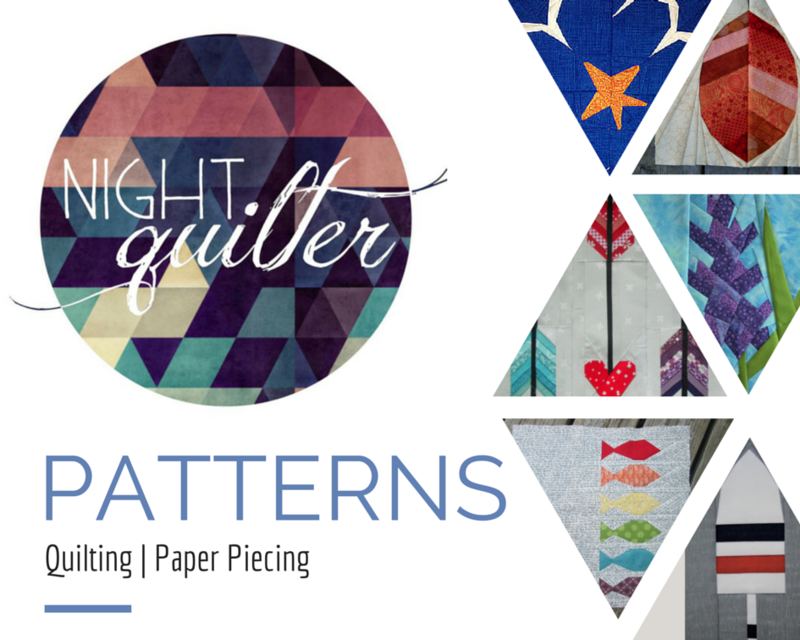 If I want to go to QuiltCon, I make it happen (at least last year!). But with lofty goals and high expectations comes that nagging feeling that I’m just not cutting it. There are bound to be deadlines that come and go without the project being finished (I’m still working on one such project). There are goals that I set that just can’t be met, not due to any lack of desire or drive, but because of the many hats I wear as maker, wife, and full time mom. My husband has often commented on how my daily to-do lists assume superhuman ability, and it is important to remember that I am only human. A thrice needed mama human, at that. With a few missed deadlines and a couple looming ones, paired with the general excitement on social media from everyone attending QuiltCon this year, I’ve been feeling a bit overwhelmed and disappointed with myself. Seeing the reminder pop up a couple days ago that it is my 2-year blogoversary really helped me back up and put it all into perspective. I’ve been quilting and designing intentionally for only two years. Yet, really, I’ve accomplished a lot! Most importantly, I work daily to balance time with my family with my creative life and I think I’m more consistently finding that balance, and missing QuiltCon this year is a result of that. I would say that’s a win. Plus, I found that my work is “out in the wild” in a couple of new, exciting places. It’s always fun to see that others are inspired enough by your work to share it, especially in big publications. My quilt photography appears in Issue 3 of Amy Butler’s Blossom eMagazine in an article written by Stephanie at Late Night Quilter about the Supernova Friendship Swap that happened last year. The above photo is the full title page spread, which is pretty awesome to see. 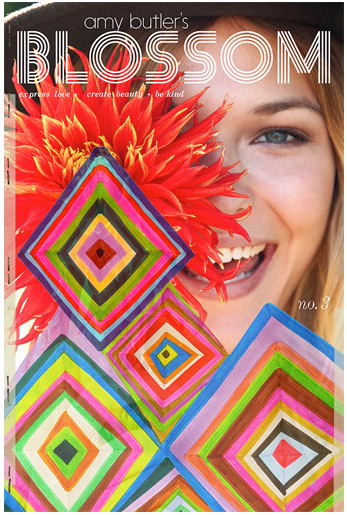 The second fun appearance is of my rainbow embroidery sampler, which is included in an article on About.com. 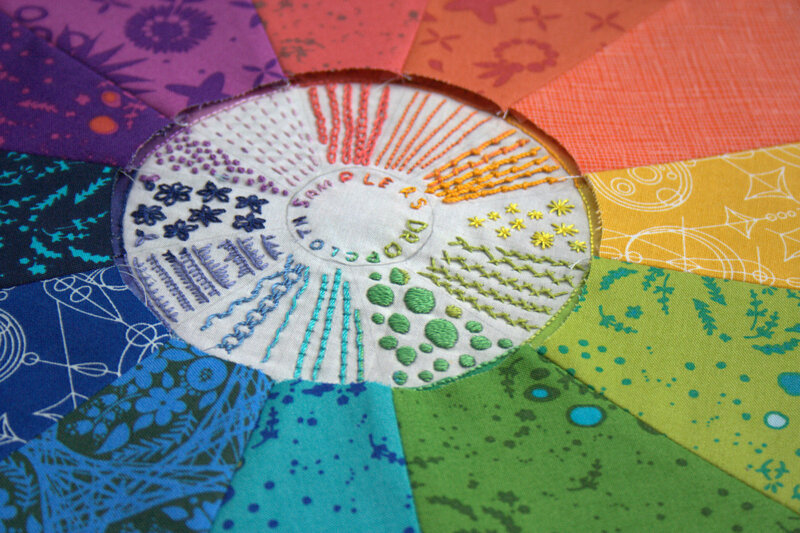 You can visit the article here, and be inspired by all sorts of fun rainbow embroidery projects. Maybe, just maybe, this will be the push I need to be brave, tackle circles, and finish this rainbow color wheel. But not until after I finish my deadline projects. Life goes on. The projects will be there. I’m sharing my reflection on the whole maker-mom journey in the hopes that it may help you put your own life in perspective when needed. The next time you’re feeling down about the project you didn’t finish, or the technique you just can’t get (yet! ), take a step back and look for the good. It’s there. It just has a habit of getting buried by everything else, at least for me. Keep on making with a smile, set your sights high, and take it one step at a time. Enjoy the journey, and thank you for joining me on mine. I sure am enjoying it!